Excessive licking can rip out stitches and lead to infection. When you have a sore, your first instinct probably isn't to lick it. 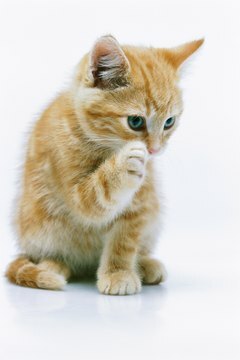 A cat's instinct tells her to lick her wounds, though, which can be dangerous -- and a little gross to watch. Take the proper steps to prevent your cat from licking her way to an infection. Check the spot where your cat is licking. If she appears to have a rash, she could be having an allergic reaction. Switch her to hypoallergenic products like food and shampoo to reduce irritation and stop the licking. If she has a distinctive open wound, however, she needs to see a vet. Healing the wound may be as simple as applying topical creams. Bandage the sore while it heals. Do not use adhesive bandages designed for humans, as these can be painful to remove from her fur. Instead, apply a non-adhesive bandage to the wound and gently wrap a stretchy, elastic bandage around the area to hold it in place. Make sure it is tight enough to not fall off, but not so tight as to constrict circulation. Your cat may pick at it here and there, but will generally find that it isn't worth her time or trouble. Outfit your cat in an Elizabethan collar. These cone-shaped collars that prevent licking are more practical than they are fashionable, so your cat may resist and look a little humiliated. After an adjustment period, though, she'll accept her situation and go on with her life. These collars come in both stiff and flexible varieties, as well as colored or transparent. Transparent collars don't inhibit your cat's vision as much. Does Petting a Kitten & They Lick You Mean They Like You? Why Do Cats Lick Each Other when They Greet?